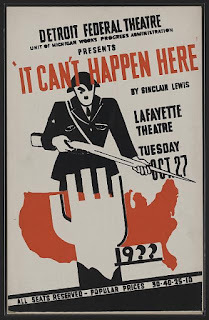 For reasons that are probably pretty obvious, I recently picked up a copy of Sinclair Lewis' novel It Can't Happen Here. I'd actually never read it, though it had been on my mind for a while. A film I directed a couple of years ago made liberal use of public domain WPA posters for set decoration, and a number of posters for the stage adaptation of Lewis' book wound up slightly out-of-focus behind our actors' shoulders. During the edit, I often found myself thinking, "I should read that one of these days." In 1935, Pulitzer Prize-winning novelist Sinclair Lewis wrote a book about fascism coming to America. Let that year sink in. 1935. In real life, Hitler wouldn't go into Poland for four more years. The book begins in 1936, the tale of an alternative future where FDR loses the presidential election to populist Buzz Windrip. And just so you're clear, yes, his name is basically "Buzz Fart." In 1936, in our actual timeline, Franklin Roosevelt won re-election for the first time, and would go on to win re-election twice more. In Lewis' novel, Buzz Windrip is a guy who talks a lot like our current, actual, president did on the campaign trail. Seven days after his inauguration, he has used his personal militia to imprison all the Congressmen (they were all men in '35) who wouldn't willingly play ball. Within a year, the states have been dissolved, the country re-divided into districts, and those without jobs or those found guilty (by virtue of being suspected) of dissent have been rounded up and placed into concentration camps. The main character of the book is Doremus Jessup, the editor of a small-town Vermont newspaper. Since the free press has been the enemy of the people since 1791, Doremus falls under particular scrutiny from the new regime, tries to flee the country but is prevented, and takes up surreptitiously printing pamphlets about the horrors that are happening under President Windrip, but which are not being reported. This is actually how fascist governments work, as evidenced by the recent uprisings in Ukraine, where old Communists are only now learning of the horrors that took place under Stalin. Early discussions about this series, Dystopian Visions, were taking place about the time I started reading the book, and I kept trying to figure out which bucket to put Lewis' novel into. On the one hand, the author certainly never intended it to be a genre novel, likely never considered himself of the tradition of H.G. Wells and Jules Verne. On the other hand, while reading it I couldn't escape the similarities between It Can't Happen Here and other books I was reading in preparation for the series, such as Fahrenheit 451 and one of the ur-dystopias, 1984. This is a Literary novel, written before the term "speculative fiction" had any currency, but it's clearly speculating, and fiction, so should I be writing a Dystopian Visions Dossier about it? What makes this alternative future different from the alternative history in Keith Roberts' Pavane, for instance? Does the fact that it takes place only a year into the future make it inherently different from 1984, which was set 35 years in the future? I don't know. But to the larger point, it doesn't matter. Because what really jumped out at me was that Lewis was painting a picture of a dystopian United States based on the real-world example of Germany's descent into fascism, which was really happening as Lewis typed. The horrors he was "imagining" for the United States were simply transposed from what was actually going down in a real country just across the Atlantic. This, for me, put the idea of "dystopia" into a totally different context. Maybe because I'm white, and my folks are middle-class, and because I went to college, the idea of dystopian literature always seemed cautionary. I think, originally, many of the hallmark works of dystopian literature were no doubt intended to be cautionary, rather than descriptive. The "what if?" asked by college graduates of what could lie ahead on one of any number of possible roads. But looking at the wide world around me today, beyond any fears of fascism or tyranny engendered by the current administration and its troubling relationship to what words mean, it's clear that dystopia is not the sole province of the speculative. You cannot convince me that a man who was a doctor in Aleppo, Syria, ten years ago with a prosperous career and happy family and has now found himself in a refugee camp or on a mortally overcrowded boat to Europe, or even trying to care for the sick and wounded in a bombed-out hospital still in Aleppo, isn't living in an honest-to-God dystopia right now. 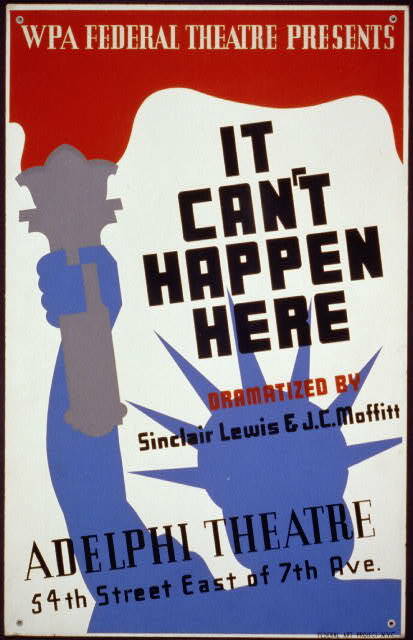 And you cannot convince me that American citizens suffering under the "separate but equal" conditions of Jim Crow laws in 1935, as Sinclair Lewis imagined a fascist America, were not living in a dystopia. Yevgeny Zamyatin and Orwell and Bradbury described dystopian police states where agents of the government could and did exercise total power over a person's body, possessions, and even life. How is that different from the real-life situation that untold millions of Americans faced because they were black and born in the century following the Civil War and before the Civil Rights Act? A situation where the government has codified its antagonism toward a huge group of people, to such an extent that those individuals must go so far as to rely on a secret book to try to stay safe while traveling, feels like the trappings of a dystopian novel. How much different is one from the other? Or, if I'm being really honest, how much different is it from the lives of many Americans right now who are living in fear of their next traffic stop? Worried that flashing lights in their rearview mirror might mean they'll never see their families again? The point is, speculative fiction is always about "now." Usually, authors are projecting the fears they feel right now into some imagined future, but that means those stories are still anchored in the "right now" part of the equation. Listen to a few X Minus One episodes to get a handle on the anti-Communist zeitgeist of the 1950s and 1960s, whether the episodes are set on a distant planet or in a distant future. But you can also, if you're willing, read dystopian literature with an eye on what they tell us about our "now." Dystopian societies — the ones we read about, the ones that have become canon, and the ones that continue to be written today — are presented as situations to be avoided. So it can't hurt to close your eyes and listen to echoes of those societies that are sounding all around us right now. The idea of dystopia being some far away puddle of quicksand we can avoid if we're vigilant is, itself, a trap. The fact is, there are some of us — perhaps "others" that may sit just outside of our usual field of view, perhaps not — existing in Orwellian conditions right now, here and abroad. The parallels to the works we've become so familiar with are inescapable. More than one veteran I know has described trying to get care from the VA as Kafka-esque. I think, increasingly, it is becoming crucial to not let the lessons of these writers remain in some far-off place I'd love to sidestep if only I stay on top of my sample ballots I get in the mail. It is important to recognize not only that it can happen here, but it does happen here, and it has always happened here. It's up to all of us to do better. We've been warned. But that's one of the gifts of nerdery and one of the long-standing fantasies when we make heroes of ourselves in stories. From War Games, where the computer nerd is the one guy capable of averting nuclear war, to Shaun of the Dead, where a pair of nitwits are perfectly positioned to battle zombies because of all the movies they've watched, to Galaxy Quest, where actors from a campy sci-fi TV show are able to fight off real aliens, it is the nerds who wind up ready to face a challenge because fandom has prepared them. Maybe this is an actual opportunity for us to step into the breach. We may not all get a chance to fight the zombies, or the aliens, but if we look around and see something going on that looks like a stepping stone to The Hunger Games, we've been prepared enough to hopefully make some noise about it. Or, if we remember the image of the citizens of Fahrenheit 451 at the mercy of their screens, which dominate their lives and blot out the opportunity to speak to each other or notice what nature looks like anymore, maybe we can have a little more awareness of our own actions and behaviors. Maybe we can approach some of our interactions with a little more critical thought. Because it seems like the two things so many dystopian works prize above all else are critical thinking and human connection. Almost like those are antidote to dystopia. So as we all move together into a future that is in many ways shaped by the predictions of science fiction, or a desire to actually make those awesome gadgets we all grew up desperately wishing were real, it can't hurt to recognize that we've already inherited some conditions that we've been warned against, and it can't hurt to take actions that try to move the needle away from those conditions. Posted by Vance K — cult film reviewer, sometime book reviewer, goddamn folk musician, Emmy-winning producer, and Hugo-nominated co-editor of nerds of a feather, flock together since 2012.